To Cite: Amini-Lari M, Alammehrjerdi Z, Ameli F, Joulaei H, Daneshmand R, et al. Cognitive-Behavioral Therapy for Opiate Users in Methadone Treatment: A Multicenter Randomized Controlled Trial, Iran J Psychiatry Behav Sci. 2017 ; 11(2):e9302. doi: 10.5812/ijpbs.9302. Background: Opiate use on a stable methadone dose is a health concern in Iran (Persia). Cognitive-behavioral therapy (CBT) is a suggested treatment for this problem. Objectives: The study aimed to assess the CBT effectiveness in the treatment of regular opiate use on a stable methadone dose in Shiraz, near the Persian Gulf of Iran. Methods: The study design was a multicenter randomized controlled trial. The study was conducted at two methadone clinics during 2015. Overall, 118 patients who were regular opiate users were selected. Participants were randomly assigned (1:1) to receive either CBT (n = 59) or remain in a control condition (n = 59). The Opiate Treatment Index, Contemplation Ladder and Severity of Dependence Scale were completed at baseline, post-treatment and a three-month follow-up. The primary outcome was the reduced mean score of regular opiate use. Other outcomes included an increased readiness to reduce opiate use and reduced severity of opiate dependence. Data were analyzed performing intentions-to-treat analyses, independent samples t-tests and Wilcoxon Rank-Sum tests. Results: CBT significantly reduced opiate use (z = 3.73, P = 0.01, d = 0.89) and the severity of opiate dependence (z = 7.36, P = 0.01, d = 0.64) after four weeks of treatment. Readiness to reduce opiate use significantly increased (t (116) = 9.55, P = 0.01, d = 0.81) over the same time. All study results remained stable at three-month follow-up while no significant change was found in the control group. Conclusions: CBT can be used as an effective intervention to reduce regular opiate use on a stable methadone dose. A larger study with more Persian participants and a six-month follow-up is suggested. In Western Asia, Iran is a vast and ancient Persian country with the traditional pattern of opium use (1).This is because of Afghanistan, the former part of Iran and the main global opium producer on the eastern borders. Afghan opiates are impure in Iran. The main route of opiate use is smoking. Other illicit drugs of use include low purity methamphetamine, hashish and low quality opium residues (i.e. Shireh and Sukhteh) (1). Methadone maintenance treatment (MMT) is widely available for Persian opiate users in Iran (1). This is the only developed MMT system in Western Asia (1). However, opiate use on a stable methadone dose has been reported among some clients (1, 2). This issue is a health concern because opiate use has important health implications among methadone patients (2). Opiate use on a stable methadone dose can leads to poor treatment outcomes and low retention rates in treatment. Furthermore, the use of opiates on a stable methadone dose leads to poor treatment compliance and a high rate of treatment dropout (3-5). Multiple reasons are associated with opiate use in methadone treatment. Some patients continue opiate use in methadone treatment because of their former drug-dependent life styles (6, 7). Long years of opiate dependence and self-treatment are other reasons associated with opiate use in methadone treatment (8). Studies indicate that MMT can lead to improved health outcomes if it combines methadone and cognitive-behavioral therapy (CBT) (8-10). However, most of the studies in the world have considered CBT for psychostimulant users (11) not opiate users. To date, there is a paucity of research about the CBT effects on Persian methadone-maintained patients while opiate use is a serious problem among this group (12). Long-term CBT may not be appealing to many opiate users in methadone treatment in Iran. Furthermore, many of them may not have enough money and time to spend on long-term CBT. Therefore conducting CBT with a few numbers of sessions may be more cost-effective and feasible for opiate users in methadone treatment than long sessions of CBT. The current research aimed to assess the CBT effectiveness in the treatment of regular opiate use among methadone-maintained patients in the ancient Persian city of Shiraz. The study design was a multicenter randomized controlled trial (RCT). The study sites were two methadone clinics with high rates of opiate use among their patients. The study was approved by the ethics committee of Shiraz University of Medical Sciences. The RCT is registered with the Iranian Registry of Clinical Trials (www.irct.ir) (IRCT2015041121684N1). Overall, 118 participants; 95% men were randomly recruited using a random number table. Inclusion criteria were as follows: at least 18 years of age, male or female gender and reporting at least weekly opiate use on a stable methadone dose. This was based on “the Diagnostic and Statistical Manual of Mental Disorders, Fourth Edition (DSM-IV-TR)” (13). Participants were needed to be maintained on a stable methadone dose for at least six consecutive months. Exclusion criteria included reporting severe drug withdrawal and/or intoxication symptoms at the time of recruitment or participation in any CBT in the past two years. Open-Epi software was used to calculate the sample size. In the last two years before conducting the study, there were 130 people who reported opiate use on a stable methadone dose. Based on such available data and review literature, an attrition rate of 20% and a power of 80% were considered for sample size calculation. Therefore, it was estimated that 118 patients were needed for enrolment. The Persian-validated version of the OTI was administered to complete the details of demographics and opiate use (14). The OTI is an internationally-approved structured interview. A score of at least 0.14 is needed to diagnose regular opiate use (i.e. at least weekly use). The high reliability of the OTI (a = 0.85) has been reported in Iran (14). In this study, the OTI was modified to assess demographics and opiate use in the last 30 days. The Persian version of the CL was used to measure readiness to reduce opiate use. The CL is a widely used questionnaire. Higher scores on the CL indicate greater motivation to change. Readiness to reduce opiate use was defined as the minimum score of one and the maximum score of 10. The questionnaire has high reliability and validity in other countries (15). Because of no Persian-validated version, the CL was assessed for reliability on 30 opiate users in two-weeks which was found to be high (a = 92). In this study, the CL was modified to assess readiness to reduce opiate use in the last 30 days. The Persian version of the SDS was used to evaluate the severity of opiate dependence. The SDS is highly approved and provides a score showing the severity of opiate dependence. Each of the five SDS items is scored on a four-point scale (0 - 3). Higher scores on the SDS indicate more severity of opiate dependence. The SDS has high reliability and validity in other countries (16). Because of no Persian-validated version, the SDS was assessed for test-retest reliability on 30 opiate users in two-weeks which was found to be high (a = 90). In this study, the SDS was modified to assess the severity of opiate dependence in the last 30 days. The primary outcome measure was self-reported reduced opiate use during the last 30 days of post-intervention. The second outcome measure was the self-reported increased readiness to reduce opiate use over the same time. The third outcome measure was the self-reported reduced severity of opiate dependence over the same time. For all of the outcome measures, it was hypothesized that the score differences between the two groups would remain significantly stable at three month follow-up. Data were analyzed using SPSS-version 21. Data were analyzed at baseline, intervention and follow-up stages. Baseline characteristics were compared using descriptive statistics. The main analyses were Intentions-To-Treat Analyses, Independent Samples T-Tests and Wilcoxon Rank-Sum tests. The effect size was calculated as Cohen’s d. An effect size of 0.3 was defined as a small treatment effect while, the effect size of 0.5 was defined as a moderate treatment effect. However, the effect size of 0.8 or higher was defined as a large treatment effect. The study was conducted in the study sites during 2015. Participation was voluntary and confidential. Consent form was obtained from each participant before conducting the study. Randomization and group allocation were done by two research coordinators. Two psychologists conducted the CBT sessions while the control group received no intervention. Participants were individually interviewed by three trained psychologists to complete the study questionnaires at baseline, post-intervention and follow-up. Psychologists were trained in the study manual. Participants and psychologists were blind to randomization and group allocation. Eligible participants were randomly assigned (1:1) to receive either four sessions of CBT or remain in a control condition (Figure 1). Overall, 59 Persian participants competed four weekly sessions of CBT and 59 Persian participants were in the control group. There was no attrition at baseline, post-intervention and follow-up. A modified CBT manual was used in this study (17). Each session took at least one-hour and half. The first CBT session included motivational interviewing. In the second CBT session, the focus was on assisting identification of high-risk situations related to opiate use. The third CBT session addressed opiate craving. Participants were trained how to reduce craving with progressive muscular relaxation and coping self-talk. The fourth session focused on coping with lapse, preparation of a coping drill for use in future high-risk situations and following lapses. The last three CBT sessions also focused on coping and relapse prevention techniques. Fidelity assessment was completed by supervising the sessions. Participants were followed three months later after the end of the fourth session. As shown in Table 1, participants were in the age range of 19 - 63 years. The mean age of the intervention group was similar to the mean age of the control group with no significant difference [i.e., 37.8 (SD = 8.7) years vs. 39.3 (SD = 10.5) years, P = 0.23]. Most of the participants had less than 12 years of education. Most of the participants in the treatment (62.7%) and control (64.4%) groups were employed (Table 1). The baseline OTI scores were similar between the two groups. Following the CBT provision, the OTI score significantly declined in the treatment group (z = 3.73, P = 0.01, d = 0.89) while the control group showed no significant difference. The result significantly remained stable in the treatment group (z = 2.23, P = 0.01, d = 0.83) at follow-up while the control group showed no significant difference. The effect size was moderate (Table 2). Abbreviations: CL, Contemplation Ladder; OTI, Opiate Treatment Index; SDS, Severity of Dependence Scale. The baseline CL scores were similar between the two groups. 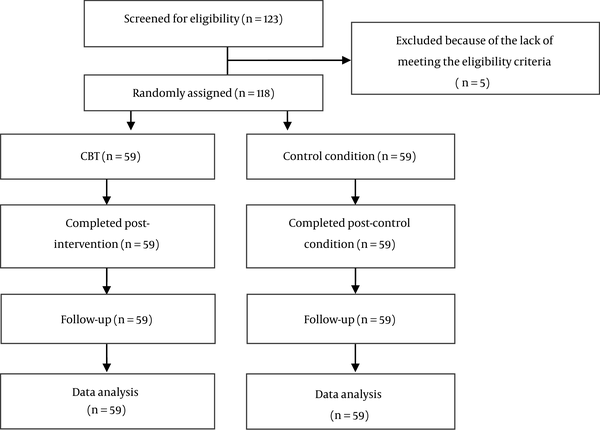 Following the CBT provision, The CL score showed a significant increase in the treatment group (z = 7.36, P = 0.01, d = 0.64) while the control group showed no significant difference. The result significantly remained stable in the treatment group (z = 4.78, P = 0.01, d = 0.65) at follow-up while the control group showed no significant difference. The effect size was small (Table 2). The baseline SDS scores were similar between the two groups. Following the provision of CBT, The SDS score significantly declined in the treatment group (t (116) = 9.55, P = 0.01, d = 0.81) while the control group showed no significant difference. The result significantly remained stable in the treatment group (t (116) = 5.27, P = 0.01, d = 0.88) at follow-up while the control group showed no significant difference. The effect size was moderate (Table 2). Opiate use is a serious health concern in Iran, the most populous Persian Gulf country (1). However, there are few studies of the CBT effectiveness in the treatment of regular opiate use. Most of the studies have focused on psychostimulant users (9, 10). To date, the current study is the first research of the CBT effectiveness in the treatment of regular opiate use on a stable methadone dose. More studies are needed to evaluate the CBT effectiveness among this group. The study resulted indicated that the OTI score related to regular opiate use significantly declined after the CBT provision and the result remained stable in the treatment group at follow-up. This was the largest effect size in this study. Similar studies in Australia and the USA indicated that illicit drug use was significantly reduced after the CBT provision and the treatment effectiveness remained stable up to six months (9, 10, 17). The study indicated that the readiness to reduce opiate use showed an increase after the CBT provision. The result sustained at follow-up but no change was found in the control group. Nonetheless, the effect size was small. Furthermore, the study indicated that the severity of opiate dependence moderately declined after the CBT provision, sustained at follow-up but no change was found in the control group. A study of illicit drug users indicated that after the CBT provision, the severity of drug dependence significantly declined in the CBT group while the control group showed no significant change (9). A study in Australia indicated that four sessions of CBT significantly increased readiness to change illicit drug use and reduced the severity of drug dependence (17). A study in Thailand demonstrated the efficacy of CBT in the treatment of illicit drug use and relapse (18). The CBT effectiveness in increasing readiness to reduce opiate use and reducing the severity of opiate dependence needs further investigation. Further studies with more samples of regular opiate users are needed to assess the long-term CBT effectiveness in improving these problems. One of the main positive aspects of this study is that we had no participant attrition. Similar studies in the USA and Australia indicate high rates of participant attrition (19-21). The lack of attrition is related to this issue that the participants were retained in methadone treatment and came to the study sites every day to receive methadone. Furthermore, there was a self-reported good relationship between each participant and the research staff. Studies indicate that the high participant attrition rate is a serious problem in the effective provision of CBT (19). However, an appropriate therapeutic relationship and high qualifications of psychologists in the provision of CBT sessions can reduce the attrition rate (20). Lack of attrition rate indicates high client engagement in the study procedure, reduced bias and increased generalizability of the study findings (19, 22, 23). The relationship between attrition rates and high qualifications of psychologists in the effective CBT delivery deserves more research. The current study has several limitations. First, the study was limited to one follow-up. This was because of limited time and cost restriction. Further studies with more samples of Persian men and women are needed to evaluate the CBT effects. Conducting a study with a six month follow-up is suggested. The study confirmed the CBT effectiveness in reducing regular opiate use with moderate treatment effectiveness. An increased readiness to reduce opiate use and the reduced severity of opiate dependence are the other positive CBT effects. The problem of regular opiate use on a stable methadone dose in Iran can be reduced with the CBT provision. Further research studies should determine the CBT effects on the health and social contexts of this group. Authors would like to thank all participants. Authors’ Contributions: Mahmood Amini-Lari, Hassan Joulaei and Hossain Faramarzi designed the study and followed the procedure of the study approval. Mahmood Amini-Lari. Reza Daneshmand, Hossain Faramarzi and Hamid-Reza Bakhtiyari conducted the study. Fatemeh Ameli and Roya Samadi designed the study data base and performed data analysis. Zahra Alammehrjerdi contributed to writing the proposal and the paper. All authors contributed to reading, editing and approving the final draft of the paper. Clinical Trial Registration Code: IRCT2015041121684N1. Funding/Support: The present study was approved (Grant No. 7078) by the Shiraz HIV/AIDS Research Center and the Vice-Chancellery for Research and Technology, Shiraz University of Medical Sciences (SUMS). The study was fully funded by the SUMS.